Newly-appointed Mayor of Riviera Beach, Florida, Mayor Ronnie Felder paid a courtesy call on Deputy Prime Minister and Minister of Finance, the Hon. K. Peter Turnquest and Minister of State for Grand Bahama, Senator the Hon. Kwasi Thompson on Friday, April 5, 2019 at the Office of the Prime Minister. 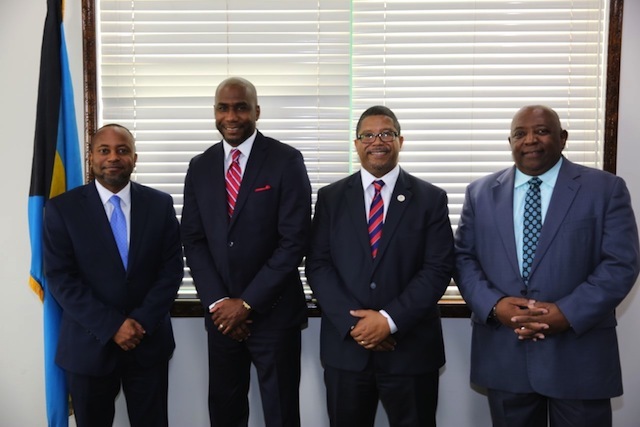 The Ministers and the Mayor spoke about mutual interests between Grand Bahama and Riviera Beach, where hundreds of Grand Bahamians visit on a regular basis for shopping purposes. Thousands of Americans from Riviera Beach and surrounding communities travel to Grand Bahama aboard the Celebration cruise ship, as well as on the Balearia fast ferry, weekly, as a part of cruise excursions, as well as for vacations.